Human Tetris. Must be college students - who else would have the time (and ability)? Watch this amazing Star Wars X-Wing Fighter 1/2-size model rocket launch. The building skill is phenomenal. Skip to about the middle to see just the launch. According to reliable witnesses, here is what really happened. Twin Tesla Coils played the Dance of the Sugar Plum Fairy at the Lawn Teslathon in Baraboo, WS. There are no speakers; the music comes from the coils. A video that's worth a million words. This short film depicts the beauty of Möbius Transformations. 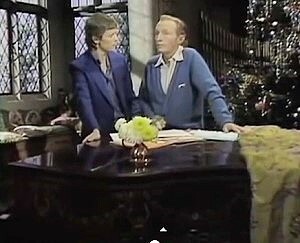 The movie demonstrates how moving to a higher dimension can make such transformations easier to understand. Brookhaven National Laboratory's Willy Higinbotham created this "Tennis for Two" precursor to "Pong" for "Visitor’s Day" in 1958. The video shows the controllers and circuit board - complete with mechanical relays that cause the sound. 11-28-2007 "It's almost a shame that the Navy's electromagnetic railgun (EMRG) can fire projectiles at targets up to 200 nautical miles away. If the enemy could see this thing fire, they'd surrender immediately." Here is a great practical demonstration of Lenz's Law. This is a fitting video for posting on Heinrich Lenz's birthday. Here is an amazing piece of software that uses a light pen to allow the user to draw simple physical machines and set them in motion according to physical laws. You will want one. 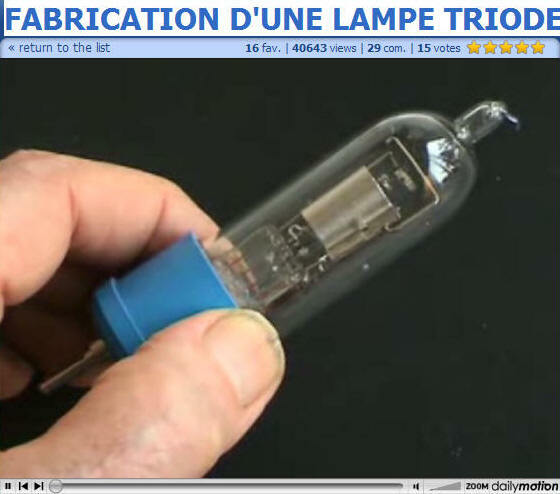 Fabrication d'une Lampe Triode. Wow - thanks to Cornell for this! Here is a truly amazing video of a master craftsman building a triode vacuum tube from raw materials - including shaping the glass, assembling the electrodes and plates, pulling the vacuum, and finally plotting the transconductance. It nearly brought a tear to my eye. Custom brass sounder clacking out a Craigslist feed. This and other solenoids from the Steampunk Workshop are true works of art. If you appreciate a mix of technology and aesthetics, this is a must-see website.